HERE IS YOUR GAME PLAN! 1. Check through your Kitchen Staples and tick off what you already have (and make sure its enough). 2. Do the shopping on Saturday or Sunday morning to make the most of fresh produce from your local farmers markets. 1. Prepare the Sweet Potato and Quinoa Burger patty mixture, shape and freeze. 2. 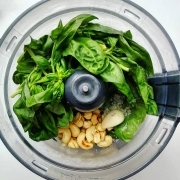 Make the Basil Pesto – this requires a food processor. 3. Make the Charred Spring Onion and Pecan Sauce for Wednesday cauliflower steaks . 4. Roast a large tray of your favourite veggies – by doing this you can build interesting creations for lunch. If you are bored with your regular roast try mixing it up by adding interesting spice mixes, herbs or toss in a pesto once roasted. 5. 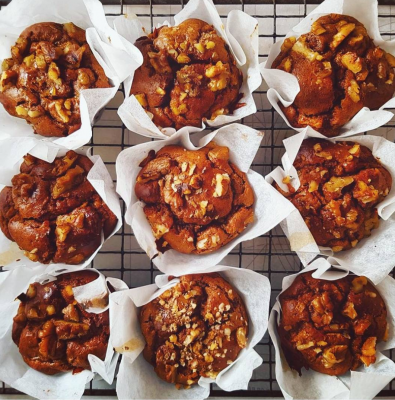 BAKE – this week I suggest trying out a batch of Cinnamon Maca Carrot Muffins (This recipes ingredients are not included in your shopping list). You should have most of these ingredients already so check on what you may need before heading to the shops. – Substitute the butter/cannellini beans for a large aubergine (cut into cubes and added at point 2 in the method). 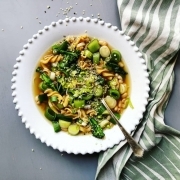 – Serve with cauliflower or broccoli rice or just on its own :). – Substitute haricot beans for zucchini. – Add some of Sundays roasted veggies into the soup to make it more substantial (added at point 4 in the method). – Make the Moroccan Buckwheat Salad with cauliflower/broccoli rice or mixed salad leaves instead. – Lower the carbs in this meal by going bunless and making an epic Nourish burger bowl instead. – Add shredded chicken – I usually poach 2 -3kg of chicken breasts or roast a whole large chicken on a Sunday (for my Conscious Carnivore). Once cooled, I will slice or shred the meat and loosely place it into freezer bags. By doing this, whenever I need to add some chicken to a dish, its just a matter of breaking off a portion or 2 and adding it to the meal. THIS = A STRESS FREE LIFE #justsaying because this struggle was real!!! – This pecan sauce is like HEAVEN and works with steak of any kind. I would suggest a grass fed Angus beef steak as a treat for this mid week treat meal BUT give the cauliflower steaks a go (even if you are not sure), they are something special! 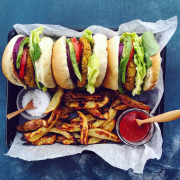 – Make beef or ostrich burgers. I prep these in advance and in larger batches, which I then freeze with pieces of baking paper separating the raw patties, this prevents them from freezing together and makes it easy to grab when needed. 1. Fry the onion, carrots and herbs in a tablespoon of olive oil for about 5 minutes on a medium heat until the onion is soft and translucent. 2. Remove from the heat and allow to cool completely – you can speed this up by placing the onion mixture into a glass bowl and place in an ice bath (I pour cold water into my clean sink and add 2 tray of ice cubes). Only a third of the bowl will be submerged and your mix will cool down much faster. 3. Add the remaining ingredients to the cold cooked onion mixture. Now (for the best part) get you hands dirty and combine the mixture by squishing everything together with you hands, then divide the mixture into 80-120 g patties. 4. Place in the fridge to firm up for 20 minutes before frying, baking or braaing or place onto squares of baking paper and into freezer bag (if you are limited with space) and enjoy when needed . 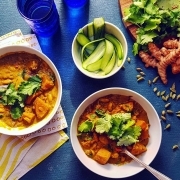 Monday: Make the Sweet Potato Korma and prep the leek soup (until point 3, then allow to cool completely before placing in the fridge). Tuesday: Reheat and finish off the soup. 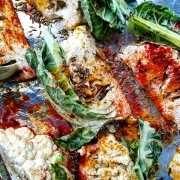 Wednesday: Serve the Cauliflower Steaks and Moroccan Buckwheat salad with your prepared Spring Onion and Pecan Sauce. Thursday: This is my lazy day so its a pesto pasta day! Friday: Defrost the prepared patty mixture, bake or fry and serve as desired. Check out the Conscious Carnivore tab below for more. Sundays are my best for cooking up a storm, putting on a great playlist and just jamming out in the kitchen. To end off my meal prepping, I always end up baking or making something to add to my snack drawer, just to finish to day off on a high note. This also means you get to treat yourself for all your efforts in the kitchen. This week, these cinnamon maca carrot muffins couldn’t be a better match for the cool and wintry weather we are having. the muffins are light, moist, comforting but are still packed with goodness and are LOW CARB, #winning! If you need any advice, help or just want to share your experience using these recipe, I would love to hear from you!